This is it! Well, not all of it, but this is the beginnings of our vegetable and herb garden. I say beginnings because we plan to do more each year in different spots around the yard, like the little spot where we planted the strawberries and rhubarb. While it may not look like much, just a simple patch alongside the house, we are very happy with the location and the plants seem very happy, too. We moved into this house in March 2007 and did not have time to get a garden spot prepared because we were focused on getting the inside of the house in order, so last year we had a container garden on the front porch. This spring we ripped out several nuisance silverberry bushes that were in this spot next to our deck. By nuisance we mean they were growing about a foot a week and becoming a pain to keep trimmed. Since this side of the house faces south we though the space would be much better suited for the first phase of our garden, and Michael wouldn’t have to deal with trimming those bushes every week. Getting them out was not easy, and though Michael dug out the roots with a pick ax and shovel, we still find some shoots popping out of the ground every now and then. They are very persistent! 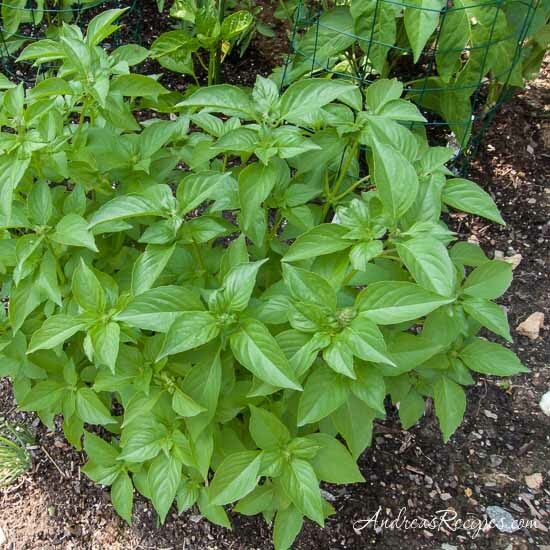 The lemon basil is looking like a bush itself, and I’ve been cutting off the buds to keep it in check, but we’ll have to do a harvest on it soon and then start two more plants. 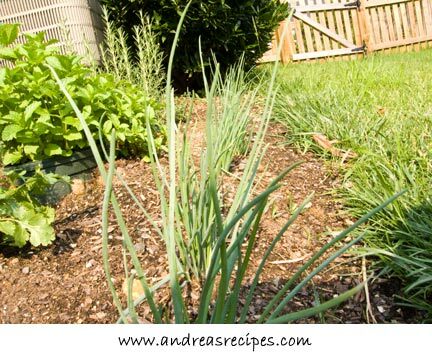 The row of shallots is doing very well, and though I’ve been tempted to snip off a few of those tops and use them like chives, I have resisted the urge! We have chives, but they are almost buried under the bushy basil plants on either side. Am I seeing ‘edging’ of the bed with some oval pots? That seems like a terrific idea, I really like that. Seems like you’re on your way to a wonderful garden. Actually, the oval pots are temporary! I’m using those for starting some echinacea and black-eyed susans for another spot in the yeard. This is just a good spot because they get so much sun there and it’s easy for watering. I was going to comment on the oval pots as well! I like them a lot! 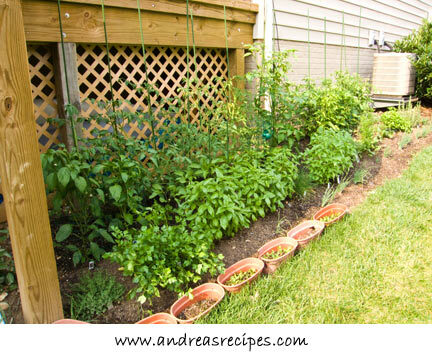 I am really tempted to start a little herb/vegetable patch myself (my coalblack gardening fingers aside…) since my potted herbs are doing really well and I love to pop outside and snip what I need for cooking. Yours look so healthy and brimming. Great! The oval pots are a great idea and one I will incorporate into my own back yard. 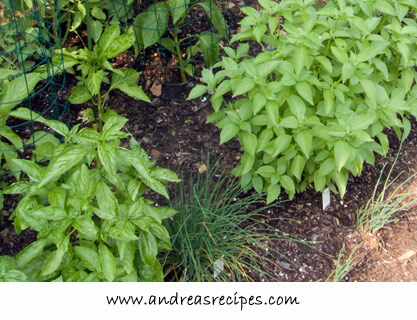 Great for adding a few more herbs or vegetables. These look so beautiful! I love the shallots too. Now I’m inspired to try to grow these next year! Everything looks so healthy and loved! Beautiful garden Andrea!